Innsbrook has the perfect place for your wedding ceremony and reception. Your love isn't like anyone else's and your wedding venue shouldn't be either! Wow your guests with something new by beginning your happily-ever-after in one of our six breathtaking venues. 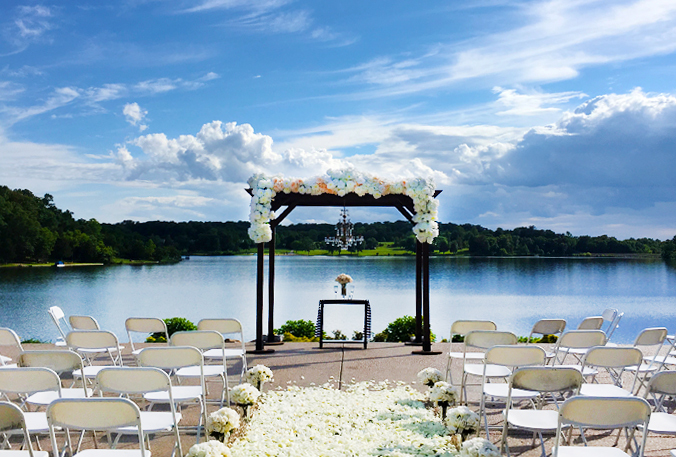 Whether you're planning an elegant lakeside affair for 250 or an intimate indoor gathering of 30, Innsbrook has the perfect backdrop for your perfect day. "The lake view is breathtaking and the food was amazing. We're still receiving compliments on everything! The wedding coordinator was a dream to work with and the staff that worked our reception was equally as amazing. They treated everyone as if they were the most important guest there that evening.…the end result was magical. The staff will make sure your day is absolutely perfect." - Heather W.
"I cannot say enough about Innsbrook! First, the wedding coordinator is absolutely amazing! They were very easy to get a hold of and was willing to help with EVERYTHING I needed." - Kara S.